StrangeCat Toys wasn’t talking trash when they said they will be bringing heat to Five Points Festival! Remember Josh Divine’s epic “Astro Crash” enamel pin? well, rumours and prototypes were floating around but today StrangeCat Toys has squashed the rumours and revealed the Astro Crash OG resin version by Josh Divine. 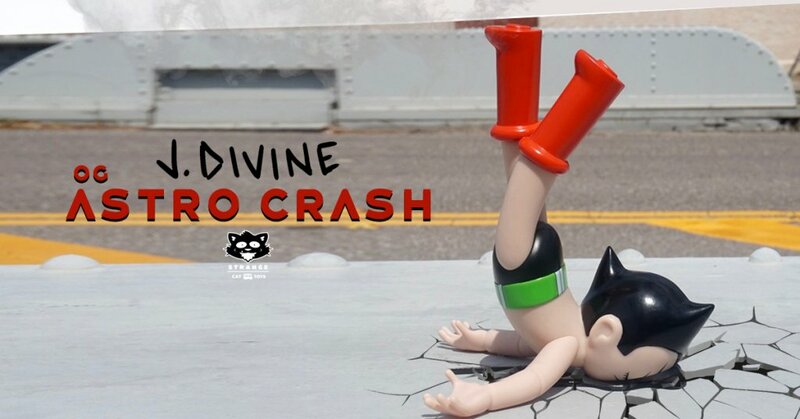 You will be like Astro Boy, falling flat on your face if you aren’t heading to Five Points Festival as Josh Divine x StrangeCat Toys will have Astro Crash OG there. Cast and Painted in the US. Josh will be at StrangeCat Toys booth on Sunday from 1pm-2pm for a signing. https://strangecattoys.com/ for more art collectable goodness.